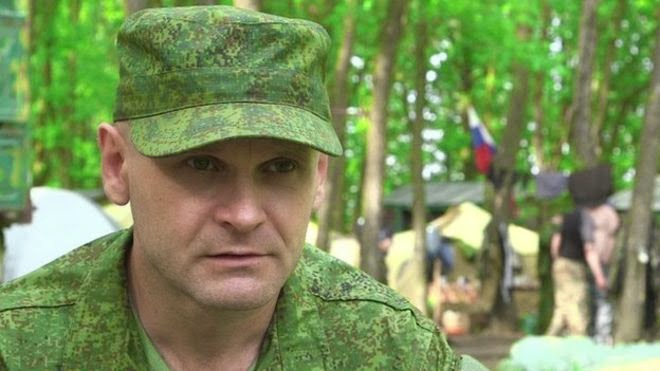 LUHANSK, Ukraine -- One of the top rebel commanders in eastern Ukraine, Alexei Mozgovoi, has been killed in an attack on his car, Russian and Ukrainian media report. Alexei Mozgovoi ran a construction company before the conflict began. Mozgovoi led the "Prizrak" (Ghost) battalion which was based in the Alchevsk area of Luhansk. Reports said a bomb struck his car, which was then targeted by gunfire that killed Mozgovoi and six others. Mozgovoi was a critic of the Russian-backed separatist leadership and the Minsk accord signed with Kiev. He took control of Alchevsk as part of the uprising that began last April in eastern Ukraine's Luhansk and Donetsk regions following Russia's annexation of Crimea. There are no details on who may have carried out the attack, which was said to have taken place on the road from Luhansk to the city of Alchevsk. One report said the attack took place near the spot where Mozgovoi had survived another assassination attempt in March. His press secretary and three security officers were reportedly among the dead. Last May he allowed the BBC's Panorama exclusive access to his militia's training camp. Mozgovoi told our reporter the conflict was "in full swing... The east of Ukraine is moving steadily towards Russia, and that's a fact". Last November Mozgovoi was seen at the head of a summary court system. "Too many women go to restaurants. What kind of example do they show to their children? From now on, we will arrest all women we find in restaurants and cafes." The Minsk ceasefire agreement came into effect on 15 February, but there has been regular sporadic fighting and both the pro-Russian separatists and the Ukrainian government accuse the other of preparing a major offensive. The Ukrainian government and Western leaders say there is clear evidence Russia is helping the rebels with heavy weapons and soldiers - an accusation Moscow denies. But the rebels are also not a single coherent force in eastern Ukraine and there have been reports of power struggles.